A luxurious river cruise to Heidelberg and Strasbourg, enjoying escorted tours to the magnificent cathedral city of Cologne and the beautiful Alsatian town of Colmar. Take a late morning Eurostar from London St. Pancras International arriving in Brussels, where a coach will take you over the German border to your ship. Moored in Cologne's picturesque historic centre, the dedicated crew will welcome you aboard your first-class floating hotel, ensuring you settle into your comfortable and extremely well equipped cabin and familiarise yourself with the ship. Koblenz is a romantic’s dream – forest-covered hillsides dominate the skyline, while the lower slopes are strewn with pretty, half-timbered buildings so typical of the Rhineland. After a satisfying breakfast, disembark to enjoy an insightful guided tour through ‘Old Koblenz’, a patchwork of narrow streets and squares, many lined with exquisitely restored traditional houses and cosy cafés. There’s time to explore on your own, maybe taking in a little shopping, before ambling back to the cruise ship. 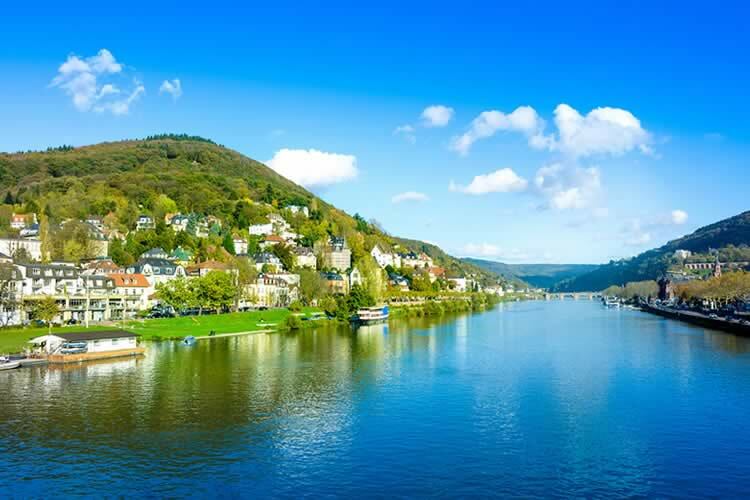 Continue upstream as you enjoy your first relaxing lunch on board and before long you arrive in Boppard, a gorgeous town on a dramatic, almost U-shaped river bend. Known as the ‘Pearl of the Rhine’, Boppard is renowned for its storybook medieval atmosphere of cobbled streets and ancient houses. It’s a delight to explore, or you can simply relax on board and watch life go by. The early evening is an ideal time to wander along the town’s attractive riverside Rheinallee promenade before thoughts turn to tonight’s menu, prepared by the ship’s chef and served to your delight in the restaurant. Slipping your mooring in Boppard you cruise through the Rhine Gorge, where the waters narrow to one-fifth their normal width and flow more swiftly. Sheer valley walls soar 600 feet and magnificent birds of prey glide on the thermals above. Teutonic knights built the numerous redoubtable castles as symbols of their power and to extract tolls from ships, but the fortresses now stand as silent ruins on forested hillsides as reminders of how fortunes change with the passage of history. This really is the magical Rhine of your imagination, so find a comfortable spot on the Sun Deck or in the forward observation lounge and enjoy the experience of cruising this famous stretch of water. Overnight you cruise further downstream and, after breakfast, take a short drive to Heidelberg, undoubtedly one of Germany’s most perfect architectural treasures and all the more remarkable because it escaped bombing during the Second World War. Set in an almost idealised German landscape, this jewel sits on the banks of the River Neckar, surrounded by forests and with an imposing castle dominating the church spires and terracotta gabled roofs of the compact Aldstadt – the romantic Old Town. Its 14thcentury university, one of the most prestigious in Europe, lends Heidelberg a genteel atmosphere rather similar to its ‘twin’ town – Cambridge. During the 19th century it was the centre of Germany’s Romantic Movement, on the route of the ‘Grand Tour’ and visited by many artists including JMW Turner, who captured its splendours for eternity. There are few more delightful places to explore, as you’ll discover on your guided walking tour, which reveals its principal attractions – including the magical stone bridge with its twin white towers – and local secrets. Afterwards, you’ll have time to explore on your own before returning to the ship to enjoy the gorgeous views as the sun sets. By breakfast you’ve arrived in France and the charming city of Strasbourg, capital of the Alsaceregion. The city is a complete delight – its centre a mosaic of winding alleys and lanes lined with quirkily crooked, half-timbered houses largely unchanged since the 14th century. During its history Strasbourg has been both German and French, and you see influences of both in its language, cuisine and appearance, creating a truly individual ambience. This morning, explore this delightful city on a walking tour with a local guide leading us to its enchanting centre – a UNESCO World Heritage Site – taking in the Petite France quarter of pretty canals lined with classic pastel-coloured houses crisscrossed with timbers and with flower-filled window boxes, the famous multi-towered Ponts Couverts, or covered bridges, and, of course, the stunning Gothic Notre- Dame Cathedral, which Victor Hugo memorably described as a ‘veritable tiara of stone’. Just south of Strasbourg lies a picturesque wine route, virtually an open-air museum of romantic medieval villages, cobbled streets and Renaissance chateaux strung like pearls on a necklace against a sweeping backdrop of rolling hills. Enjoy all this on a splendidly scenic drive, soon arriving in the medieval town of Colmar, the best-preserved in Alsace. Little known outside the area, it’s a magical concoction of canals, former merchants’ houses, ancient religious buildings and antique shops. The cathedral quarter is surrounded by pastel-coloured half-timbered houses displaying the intricate wrought-iron hanging signs so typical of this area of Europe. You’ve plenty of time here to sit, enjoy a coffee and watch the world go by or just wander. Return to the ship in Strasbourg for dinner. One of the joys of life aboard your cruise ship is the sheer sense of relaxation it brings: time to catch up on some reading, enjoy a game of chess or perhaps improve your ‘putting’ on the Sun Deck golf green. Why not enjoy a coffee with your congenial travelling companions or simply watch the river traffic still using this vital artery through central Europe? In the late afternoon visit Rüdesheim – if you imagine a typical Rhine town, then this would be it! Narrow crooked streets lead down to the sweeping river with a backdrop of wooded and vine-covered slopes. Riesling is the speciality grape here and Rüdesheim has many atmospheric Weinstuben where you can sample local wines produced from the surrounding vineyards. This morning, early risers can enjoy phenomenal views as once again you pass through the Rhine Gorge where, in Wagner’s Ring Cycle, the Rhine Maidens guard lost treasure, the ‘Rheingold’. What better way to spend the morning than relaxing on the Sun Deck beneath dramatic rocky, vineyardtopped valley sides dotted with romantic ruined castles. The valley sides dissolve and hills give way to plains as you progress majestically to Cologne. This afternoon you can discover this fascinating city on your tour led by a local guide who’ll help you get the most out of your visit, which of course takes in the twin-spired cathedral, the largest Gothic church in Northern Europe, miraculous survivor of Second World War bombing and a UNESCO World Heritage Site. It took six centuries to complete, and among its many treasures are the magnificent stained glass windows and gilded sarcophagus said to contain the remains of the three kings from the Nativity story. You'll also see the vibrant Old Town, beautifully restored and boasting an abundance of excellent shopping and cosy bars, some of which still brew their own beer. As night falls, a sumptuous dinner provides the perfect finale to this memorable cruise through the romantic River Rhine. This morning, at the appropriate time, you drive to Brussels connecting with the Eurostar service to London St. Pancras International. Should you be returning by air, you will be taken to the airport for your homeward flight.